I’ve been a fan of Alexander McCall Smith for some years now – his novels are light, gently amusing and always an enjoyable and easy read. He is most famous for his No. 1 Ladies Detective Agency series, set in Botswana, and he love Africa. 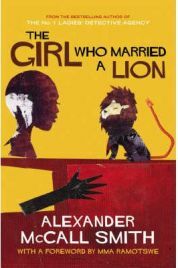 He has also published a collection of African folk tales, The Girl Who Married A Lion; this was originally published in 1989 as The Children of Wax, but has been updated since then and includes tales from Zimbabwe and Botswana. I’ve often seen The Girl Who Married a Lion on library shelves, but was never particularly desperate to read it. However, when I spotted it in the recent Kindle book sale for only £1.06, I thought “why not?”. The Kindle edition which I purchased was called the Illustrated Children’s Edition, but the Kindle edition certainly contains no pictures – although I assume the print version does. McCall Smith collected these tales from the people of Zimbabwe and Botswana. Like many African cultures, they have a strong oral tradition when it comes to storytelling. These stories, and others like them, would be passed down from generation to generation through spoken storytelling. This oral style is immediately evident in the style that McCall Smith has written the stories – you can imagine them being told aloud by a village elder to teach the children about morality and honesty. The style can seem slightly off when you are aware of it as being written down, but the trick is to immerse yourself in the tales and imagine yourself in Africa, perhaps at sunset beside a fire. That’s what I did at any rate! The stories themselves all have a moral. The people and animals in them who are dishonest or tricky usually get their comeuppance, and so we see that we should not be like this. On the other side of the coin, those who are good and honest and fall victim to those who are less so will usually have the happy ending that they deserve. Many of the stories feature animals, who talk and work together, and often communicate with humans. While to many of us this may seem an unrealistic (if enjoyable) aspect of the story, there is something very natural about the animals involvement in these African tales. They fit. While I was reading The Girl Who Married a Lion, I did not question the animals roles at all (well, possibly with the exception of the lion who survived having his skin removed by a hare). There are other elements to the stories which would seem unrealistic in another context, such as the tree which dispenses vast quantities of food. The stories are all very short, some of them only a few Kindle pages long. Sometimes this didn’t bother me, but at other times it did. I started to get really into a story, to become invested in its characters future, and then it was finished, which seemed disappointing. However, bearing in mind that these stories are written for children and adults, the length of them would be good for keeping a child’s attention. I will say one word of caution about children reading this though – there is quite a lot of death in these stories, and often of the “good” characters. The deaths are written in a very matter-of-fact style, and are not gory, but young children might find it upsetting. I thoroughly enjoyed The Girl Who Married a Lion, it was a short and relaxing read. I found myself transported to Africa, thanks to both the nature of the stories and the style in which McCall Smith has written them. While the length of the book means it is probably not worth full price, it is one to look out for in sales or your local library. No Comments on "The Girl Who Married a Lion"